Valentine’s Day can be such a fun day time of the year! Children are passing out Valentine’s cards and enjoying all the fun heart themed activities. If you want to make Valentine’s Day even more exciting during this time of year, why not do some Valentine’s Day science experiments! These are good for rainy day afternoons, or just when you need something fun to pass the time! Each experiment is so unique, and they all incorporate different parts of Valentine’s Day! From candy hearts to fizzy heart shapes, there are endless possibilities! 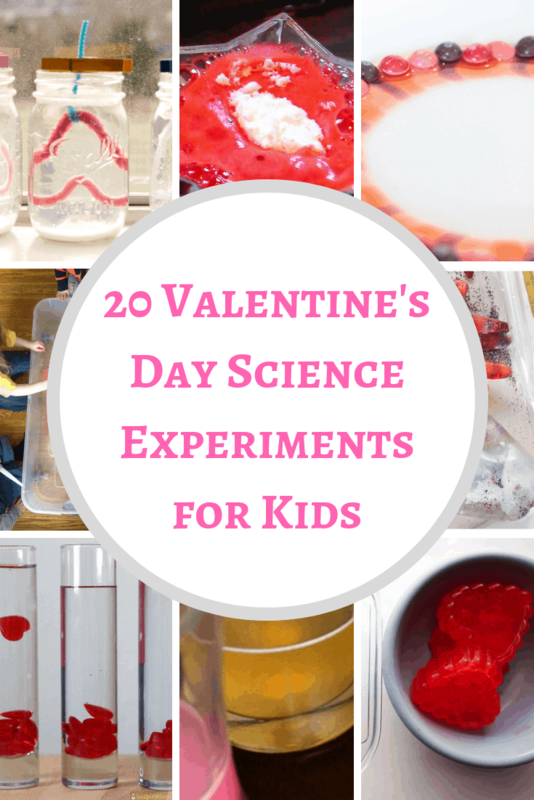 Here are 20 awesome Valentine’s Day science experiments for kids. Learn a little about physics with this exciting and mind-blowing Chasing Hearts Challenge from Steam Powered Family. Have fun mixing with this Love Potion Science Experiment, with a reward of a satisfyingly fizzing, foaming end! Since all kids love fizzing and foaming, this Valentine’s Day Lava Lamp is another must try Valentine’s Day science experiment. Be sure to make a whole lot of these Fizzy Baking Soda Hearts because your kids are going to want to fizz them over and over again! This giant heart also fizzes and sizzles in this fun Valentine’s Day Science art activity from Red Ted Art. This Frozen Hands Science Activity is part science discovery, part sensory activity, with a side of Valentine cuteness. While we are freezing things, learn how different substances react to freezing with these Frozen Vinegar Hearts. If you are like my family, you probably have a startling amount of conversation heart candy laying around this time of year. Thankfully there are several fun science experiments and activities to help you use them up! Candy Heart Rainbow Science Experiment by Fantastic Fun and Learning is a great way to experiment with science while using up some of those candies! Conversation Hearts Goop from Raising Lifelong Learners is another fun activity for those conversation hearts. Practice hypothesizing and comparing with this Disolving Candy Hearts experiment. Now that you’ve compared how conversation hearts dissolve in different temperatures of water, be sure to try this Candy Hearts Experiment experiment comparing how the hearts dissolve in different solutions. While we are on the subject of Valentine’s candy, this Valentine Skittles Experiment themed is another great way to use some of that extra Valentine’s Day candy. Bubbles are always a hit at my house This fun Valentine themed Bubble Science activity will teach your kids the science behind bubbles! Your kids will love watching the colors erupt, scatter, and mix while experimenting with these Magic Milk Hearts. Kids never get tired of slime activities, so add this Valentine’s Slime to your V-Day experiment list! These Gel Window Clings not only provide Valentine’s Day decor, but will also give a lesson about how some substances can change over time. I love this beautiful Raining Hearts science experiment, that also has a lovely picture book recommendation! Can you even have Valentine’s Day without chocolate? If you agree that you MUST have chocolate this Chocolate Heart Food Science experiment is right for you! Valentine’s Day is the day for secret admirers, and this Secret Message Baking Soda activity could not be more perfect for the occasion! Want to help Cupid with his job on Valentine’s Day? These Flying Cupids are full of awesome science information that your kids will never forget thanks to this fun experiment! Which Valentine’s Day science experiment was your favorite? Thank you so much for including our frozen, fizzy baking soda hearts - they are always such a favorite! There are so many fun ideas here - sending this link to my daughter's teacher for their Valentine's Day party!